I am really happy for you guys as you now have a true expirience of how others live their lives. Yes this will not change the way they make their daily living but today atleast someone from a comfortable home knows how others suffer. Very thought provoking that transport is almost 50% of a person’s monthly spend. You also didn’t need to buy any new clothes in the month, so that would be another expense. And then there is the obvious lack of putting any money away for later – not relevant to you specifically – but saving in S.A. is a huge issue… people have no money left to save. Tracey, the fact that there is no money to save affects generations in the end. Not an easy life at all, but I salute those who try to make the most of the little that they have. Sad in every way. Active citizenry always highlight and attempt to address the inequalities that existing within a community. We individually have a part to play and I am sure through this and other actions you may take we will see change. I believe this will allow many other people to ACT.. 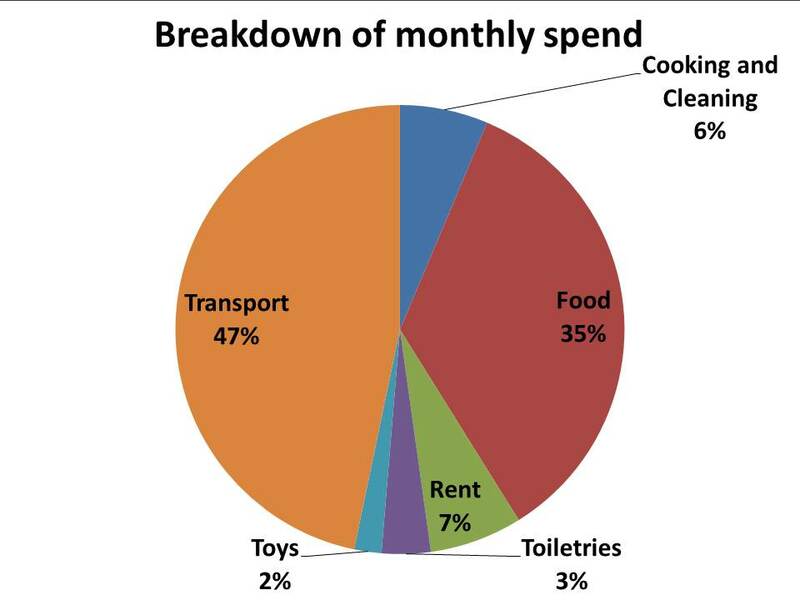 It is clear that a massive proportion of your monthly budget was dedicated to transport, and unreliable transport at that. The problem with your admittedly honest breakdown of the data is that it perhaps gives a false impression as to the affordability of public transport in South Africa. Transport in South Africa still remains reasonably priced when compared to developed Western nations. As of 2011 “…the average UK household spends only 1.1% of its budget on rail, bus and coach fares – much the same as ten years ago…”. Even if you were to include all forms of transport, including buying cars and petrol costs that figure only increases to 13.4%. A substantial increase but way lower than the 47% on your budget. The issue is rather with the suppressed average monthly income in South Africa which clearly cannot support even moderately priced public transport. As with most things it is education that will address these issues, more likely than not over several generations. As the average level of formal education increases we can hope to see corresponding wage increases. Equally as the public transport infrastructure in South Africa increases, beds down and matures you may see other franchises enter the market and facilitate pricing competition. I wonder what your next steps might be. Since so many voices of Black South Africans have been silenced, perhaps using your privilege and power to make sure these voices get heard, and their authentic experiences listened to. If you have not read the American book Black Like Me, and the events surrounding it, I highly recommend it. this was really a commendable effort to try understand what other South Africans are going through. I guess if our leaders would put themselves in the shoes of the people who put them in power, they would be more compelled to try solve some of these issues. 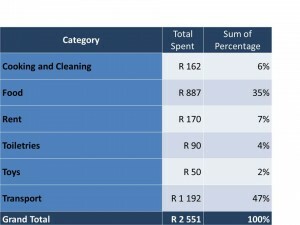 When using 40% of your budget for transport, what kind of transport was that? Did you take taxis at all? Or just the bus?